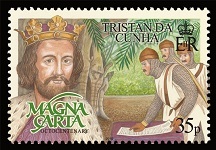 This set of stamps commemorates the 800th anniversary of the granting of the charter by King John that forms the basis of Common Law rights to liberty and justice in countries around the world. 2015 sees the 800th Anniversary of the granting of one of the most famous and celebrated documents in history. This was not the first time that a monarch had agreed in writing to place limits on the power of the crown. Henry I had issued a Royal proclamation, the Coronation Charter, on his accession to the throne in 1100 to atone for the abuses of his predecessor and to ensure a steady stream of income from the nobility during his reign. However that charter was conveniently ignored for 113 years until the Archbishop of Canterbury, Stephen Langton, in a long term dispute with King John showed the old charter to the Barons and the idea of a new improved charter took hold. Amid great theatricals at Runnymede the Magna Carta was granted by King John and peace restored, with the Barons renewing their oaths of allegiance to the King. Yet just 10 weeks after its creation it was annulled by the Pope, England had plunged into civil war and by October 1216 King John had died of dysentery. The Magna Carta had, nonetheless, become an idea that could not be unimagined, denied or forgotten. In front of an audience of Barons and Bishops a reluctant King had been dragged to a meadow in Surrey beside the Thames and forced to seal into law articles and clauses concerning liberties which we now call freedoms. No longer was the King above the Common Law of the land. At least 13 copies, of which 4 survive today, were quickly made and distributed throughout the kingdom. The Magna Carta had gone viral. When King John applied his seal to the parchment he could not possibly have known the significance of what he was doing. Despite what it stands for today, Magna Carta was not written with lofty ideas of justice and liberty in mind. It was originally meant as a peace treaty between King John and his Barons, with whom he was at war. The Barons had captured London and John found himself in a political mess in need of a quick solution. 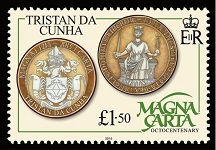 But over the course of the next 800 years the idea of Magna Carta gathered momentum and assumed a greater authority in respect of the central key clauses concerning liberty and justice. These central clauses have not only stood the test of time, but have made an irreducible claim on governments around the world. For those of us who live in Countries informed by Common Law (UK, USA and the Commonwealth) these are the clauses upon which our Country's laws are based and our hopes for justice, freedom and civil peace depend. 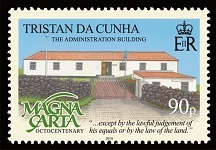 Two excerpts from these clauses are included on the stamps. They basically state that the law belongs to everyone, not just the powerful and they are the bedrock of our society today. For 800 years Magna Carta has influenced history. 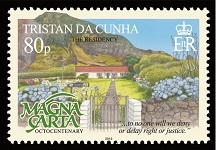 It played its part in the first ever directly elected parliament in 1264, spread via France to the rebellious colonies of the New World where Thomas Jefferson used the breaches of the Magna Carta as retrospective justification for creating a brand new country in 1776 and today The European and UN Convention of Human Rights echo Magna Carta.